The work focuses on centering the experiences and needs of queer women and mothers, transgender, gender nonconforming, and nonbinary parents who face marginalization within the greater LGBTQ community due to sexism, misogyny, and transphobia. All of these factors contribute to the oppression of individuals and lack of access to necessary information, community, and support. As told by Kersh Branz, Founder & Photographer of The Pride & Joy Project. Kersh and Toby Branz, 2016. First let me say that it has been my honor and the journey of a lifetime to work with all of you on making the world a better, more inclusive place for our queer families. When The Pride & Joy Project began I had no idea how much of an impact this experience and work would have for families around the world. Before I tell you about The Pride & Joy Project let me go back to share how it all began. It was the end of the summer in July, 2014. 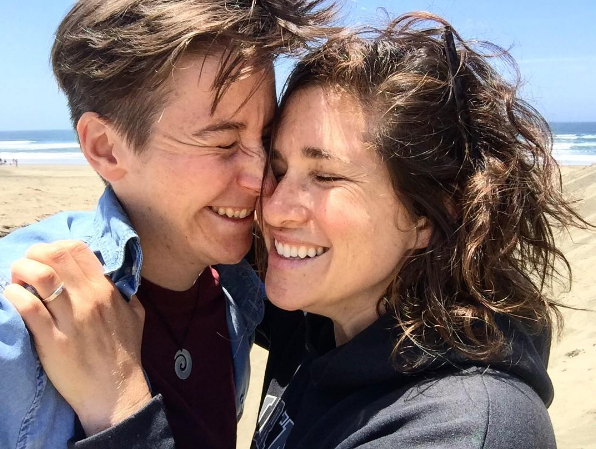 My wife, Toby, and I had just celebrated Pride the month earlier and were still feeling the electricity and inspiration from being with our community so closely. Dancing in Dolores Park, marching down Valencia Street with the drums, and making labels for our clothing that read: “queer teachers save lives” and “dyke pride” were just a few of the highlights of a particularly memorable dyke march and festivities. Both of us have always cherished Pride celebrations since we were young and in need of support. Anyone in the LGBTQ+ community can tell you about the transformative experience that is a pride celebration -- especially the feeling of being surrounded and embraced by an entire community of your peers - whether known or not. Toby and I were discussing the joy we felt seeing other queer families with their kids marching at Pride. I talked about how their visibility was empowering and motivating. It was in that moment that we both realized that we were ready to start our own journey to become parents. We purchased sperm from a sperm bank. Went to all of the initial appointments and held our breath. There was so much potential excitement and also confusion, in every step of the process and we felt so isolated from other parents who had travelled this road before. How did they decide which sperm donor to use? What methods and options did other queer mothers use to try to conceive? What about adoption or IVF? What were the benefits and drawbacks of all of these ways to make a family? What did the waiting period look and feel like? How do we know our children would be safe and protected legally? All of the questions and information gave both of us a persistent level of anxiety and stress that challenged us and brought us closer together in our relationship and our marriage. Spouses for life. (Me & Toby at SF City Hall, 2013). We had a community of queer friends who we loved but none of them, that we knew of, were parents or were actively becoming parents at the same time. We didn’t know who to talk to or ask for help and support. It was such an isolating and perplexing experience to be living in one of the most progressive, queer cities - San Francisco, California - and STILL feel disconnected. How was it possible that there were not more resources that connected queer parents and families at each stage of their journey? The questions continued and still do to this day. Neither Toby or I had the answers we needed to make fully informed decisions and reflections on becoming parents. That was a significantly challenging part of our lives because of the extreme lack of first person, community driven, queer-only, inclusive parenting spaces. Then, as if by magic the idea came to me in the middle of the night: The Pride & Joy Project. It was such a crystallized thought that it woke me up completely. I jumped onto my computer and purchased the domain name and began to figure out what The Pride & Joy Project was and how I would go about creating and building it to help other families. I have worked as a professional photographer for more than 10 years and have personally seen the ins and outs of queer identity, culture, and experience shift and change through the years. I have photographed and felt the deep, ancestral trauma, grief, and oppression of my people by meeting, learning, and working with them. Hearing their stories, their joys and their triumphs, their struggles and their challenges, has built the foundation of who I am as a person. A person that is passionate about improving the lives of queer people through art, storytelling, and connection. My knowledge of the LGBTQ community told me that queer women and mothers, transgender, gender nonconforming, and nonbinary parents and people were and are continually marginalized because of deeply rooted misogyny, sexism, and transphobia. I’ve seen and experienced the damage that fear, stereotypes, stigma, and prejudice have on people who are labeled as “other” by a dominantly heteronormative society. The ripples of this constant cycle of abuse effect every member of the community and carry over to their families. Knowing this continues to push me in all that I do. I know that we can find a way to listen, strengthen, and sustain our communities so that we can heal and thrive - we can do better. The Pride & Joy Project Is an independent portrait series focusing on queer mothers, transgender, gender nonconforming, and nonbinary parents and families. I have worked with families that I connected with through word of mouth, craigslist, facebook friends, and personal connections to photograph them and share their stories. It made sense to me that each family would be photographed in their home or a place of importance to them - to show the ordinary and extraordinary moments of our lives. The response to the first batch of portraits was phenomenal --- it lit a fire in my heart and was welcomed by the community with love and appreciation. I knew that I had uncovered a greater purpose for my work as a photographer - that this was more than just a portrait series. As I drove home from the first photoshoot with a 2-Mom family in the North Bay, I started to cry. I realized I had found the key I had been searching for. A key that connected us to other queer parents and families in our community that made it possible for us, and others, to share our experiences, our knowledge, and our information on how we created our families. It was a moment of clarity that continues to inspire me, today. At the start of 2016 I had photographed over 30 families in the San Francisco Bay Area and several in Provincetown, Massachusetts during Family Week. Out of those families I had kept in touch with a group of about 100 - 115 parents and future parents who knew of and supported the work. We spoke regularly over email and many of them asked if I knew of or could create an online community for them to meet and connect with the other queer parents. Of course! After searching through facebook to see if groups existed for queer parenting communities - especially those for queer mothers and trans, gnc, and nonbinary parents - nothing came up. There were several groups that were small, private, and specific to a region or location - but none that I could see provided access to a global community of connection and support. Within a few hours I had created a facebook group called Queer Mamas* (Now called Queer Parents). The initial 115 people were invited and it took off. Within 10 days the group had expanded into 10,000 members -- all connecting by word of mouth, the network of each individual, friends, friends of friends, and a driving need for queer spaces. Toby and I forgot to eat, sleep, and function out of sheer excitement. We tried to personally welcome each individual to the group but the task became too dizzying after 300, 1000, 5000, and then 10,000 parents were suddenly all in one place. As this was happening a certain orange authoritarian was beginning to clog the airwaves. It was a welcome change to our facebook newsfeed when Queer Parents came into existence. Instead of seeing post after post of news about fear, the election, and outrage - it was replaced with literally thousands and thousands of photos of queer families introducing themselves to the group, asking for recommendations on strollers and baby carriers, remedies for teething, how to process forms for second parent adoption, how to find books on gender nonconformity for gender fluid kids, what drawings their kiddo created for them in school, celebrating their successful adoption, and so much more. Since then Queer Parents has grown into a global network of over 18,000 members from communities large and small that actively share, support, and engage each other in an online forum. The group encourages any parents who can’t find what they need in our large group to create sub-groups for their specific needs and interests. To date more than 100 subgroups have branched out across world supplying the very real need for queer-community spaces in both rural and urban environments. In 2017 the portraits from The Pride & Joy Project were featured in a group show at the Oakland LGBTQ center and a solo show at Glama-Rama Salon and Gallery in San Francisco. The facebook group Queer Mamas* has evolved over the past two years and changed - as all spaces do. For a brief period of time, Queer Mamas* was renamed to The Pride & Joy Project Family Network in the hopes of bringing the portrait series and the facebook group together. After lots of debate and community feedback, a poll was created and the group opted for another renaming - this time, to Queer Parents. The renaming was an important step for the group and a nod to the need for more inclusivity in our community for transgender, gender nonconforming, and nonbinary parents and people. As of April 2018, The Pride & Joy Project will continue to exist as a portrait series with the facebook group Queer Parents a separate space for conversation, community, and support. Thank you to everyone for your patience and your understanding as the process shifted and changed! We have also began adding resources and community information to our website for you to use and share. You can check out The Pride & Joy Project on facebook, instagram, and twitter by clicking on the links below. We post a variety of news, content, & more on our facebook that's totally different from our website. If you love The Pride & Joy Project be sure to share it with your friends & family! Use the hashtags #PrideandJoyProject to send us your favorite family photos, videos, and content. We repost often & give credit whenever possible.